From Sindhishaan of Jan-Mar. 2006 I am glad to know that 12th International Sindhi Sammelan held in Mumbai from Dec. 28 to 30, 2005 was successful with the efforts put by Sahyog Foundation and Sindhishaan. Congratulation to Shri Ram Jawhrani, Shri Raj Daswani you yourself and many other Sindhi workers for making the Sammelan a success. I am glad to know that a high power committee to resolve the grievances of Sindhi Community was constituted in the Sammelan and Shri Ram Jethmalani, Ex-Union Law Minister and eminent lawyer, political and social worker accepted to be the Chairman of the said committee. There is a problem of Sindhis who have migrated to India after partition of the country in getting themselves registered as citizens of India. There are number of difficulties faced by the members of our community under the Foreigners Act. I am sorry to find that the Govt. and its officials have no such sympathy for us which they had at the time of the partition of country. I find from my experience that the Govt. of India wants to discourage Hindus from migration from Pakistan to India. The Govt. of India does not realise that the partition of country was against the wishes of Hindus not only living at that time in the territory known as Pakistan but also the Hindus living all over India at that time. As such the Hindus migrating from Pakistan to India have got the fundamental right of migrating and their settlement in India at any time. Such Hindus were compelled to acquire the citizenship of Pakistan and if they are prepared to renounce the citizenship of Pakistan are entitled to be registered as citizens of India without any objection. The Indian Govt. can not refuse to grant them the citizenship of India on their migration from Pakistan. The communal problem in Pakistan is not solved. Hindus living there are treated as second class citizen. The Govt. of India does not realise that in case Hindus migrating from Pakistan to India are not granted citizenship of India, the result will be that they will be forced to convert to Islam and add to strength of Pakistan our enemy which is creating day to day problems for India and disturbing our peaceful life here. Some of Sindhi Hindus who had come to attend the international Sammelan in Mumbai went to Pakistan to see their original abodes and their experience is worth noting, in the sense “SINDHI AAYA SINDH DISANA” from Jan 3 to Jan 10, 2006. From Institute of Sindhology it is heartening to note that it gives the best portrayal of amalgamations of the Islamic and Buddhist architectures of Jamshoro. It proves that before the attack and capture of Sindh by Mohd. Bin Kasim, Buddha religion and its architecture was there in Sindh. Shri Prem Lalwani, Chairman of Alliance of Sindhi Associations, USA said, “but now when we are in the world, we say the World is Sindh” this shows our nature and the beauty of our culture. 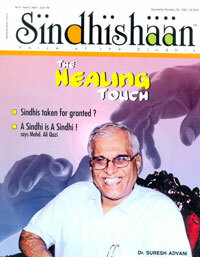 Shri Prem Lalwani is very correct when he suggests that Sindh being the land of Sufis, saints, always bearing the message of love and peace should be made independent like Vatican, This supports my idea that our demand of separation of Sindh from the rest of Pakistan on national as well as International forums is justified as I have written to you in my last letter dated 29/03/2006. How much touching and appealing are the words that Sindh our Motherland calls us “OH! SINDHIS THE SONS OF THIS SOIL WHERE ARE YOU? HAVE YOU LEFT ME TO FORGET? OR FORGOTTEN ME AND LEFT ME FOR EVER? COME, COME THIS SOIL IS LONGING FOR YOU, YOUR MOTHER IS WAITING FOR YOU WITH HER ARMS OPEN AND TEARS IN HER EYES.” It is infact a call from the mother to her sons. I pray to god that we Sindhis should realise that we are separated from our mother and mother is calling us to come back. The news item further says “On drive back our hearts were heavy no one was looking at anyone, every one was peeping inside their own self. Perhaps asking themselves WHERE DID WE GO? FROM WHERE ARE WE COMING? IF THIS IS OUR LAND WHY ARE WE GOING AWAY FORM IT? IF THIS IS OUR MOTHERLAND WHY DID WE LEAVE IT? WHY ARE WE LANDLESS? WHY? WHY? WHY? There were many questions but no answer.” According to me the answer can we found from true history of the partition of county which we are forgetting. This message for media given by Shri Raj Daswani the leader of the party visiting Sindh was” what message can I give to my motherland? My mother has to give me the message. Let her guide us and demand what we have to do for her? While leaving the land of Sindh. He realised “today my Sindh mother was running beyond my plane, following me on the runway, with her arms open, shouting and shedding tears. HER CALL WAS NOT FOR ME ALONE, BUT FOR YOU ALL SINDHIS WHO HAVE FORGOTTEN THEIR MOTHER SINDH. This supports me when I say that we should not only try to learn and use Sindhi language but also keep on remembering the true history of political partition of our country. Regarding article freedom struggle on page 30 of your magazine it is pleasant to note that Sadhu Hiranand was a co-disciple with Swami Vivekananda at the Ramakrishna Paramhans Aashram at Calcutta. It is also noteworthy that Sadhu Hiranand's elder brother published the woman's journal Sudhaar Patreeka in Gurumukhi script to bring awakening in Sindhi ladies and Mirza Qalich Beg's the heroine, Zeenat presented a Sindhi Muslim family in its natural surroundings and Zeenat gave up Purdah and became her husband's companion in all walks of life. The words of Sindhi General Hoshu or Hosh Muhammad, who at the time of sacrificing his life for the motherland said, “I WILL KEEP ON COMING BACK TO THE SAME FOLD, GO ON DYING AND TAKING BIRTH, TILL MY COUNTRY IS FREE FROM FOREIGN YOKE.” This sentence supports our theory of rebirth again and again till we achieve the goal of our life. Regarding the article of Shri Arun Babani, “Pride & Prejudice” it is not very encouraging when he says, “In the absence of my unique and typical Sindhi cultural psyche, there is an automatic absence of any lack or self pity among the young generation of Sindhis. This fact alone makes the problem of pride and confidence redundant and obsolete.” My request to Shri Arun Babani is that we Sindhis are part of Hindu society and the picture of Hindu youth is not gloomy to that extent. Our youngsters of Hindu society are doing very well in the world over in every walk of life. Even for Sindhi youth my experience is that they are working hard and have number of qualities and habits of earning, learning, serving the humanity and the poor class of the society and they will be raising the head of Sindhi community with pride. From page 60 of your magazine I find that Lata Jagtiani is writing a book on Sindhis who saw the partition of India through their worn eyes and their first hand or second hand accounts to save for posterity and history. She has requested all Sindhis who have something to share for her project to contract her by email. I will try to contact her as desired by her and try to request her to prepare a questionnaire about the information she wants to collect and try to circulate the same among the person who were grown up at the time of partition.